In the ongoing sue-fest between Apple and HTC, Apple was handed a limited victory today by the U.S. International Trade Commission, which could theoretically result in the banning of some handsets. In strategic terms it may be a larger victory for HTC and the Android ecosystem, as the ITC only endorsed a limited view of the sweep of Apple’s patent. HTC announced via email that they already have a work-around solution to avoid what is known as the ‘647 patent, which is relates to letting a quick-contact pop up occur when a user clicks on an email address or phone number. That means that no HTC phones will actually stop shipping. Apple may choose to try and challenge HTC’s work-around, claiming they are still in violation, but that would take several more months to get a ruling. Strategically, the fact that the ITC only upheld a narrow view of the ‘647 patent means that Android in general will probably not be negatively impacted by the ruling, especially with changes to this specific technology already seen in the 4.0 Ice Cream Sandwich version of Android. So Apple wins a small battle, but hasn’t made much progress in the war. Don’t fret, we can surely expect more rulings to be handed down on both sides in the coming months. First. Justice has been served, ban HTC devices since they're violating copyright. Wow I guess you can't read very well. 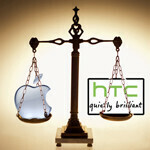 HTC will not be ban because none of the current HTC device are running 1.6 to 2.2 beside the thunderbolt. If you happen to read other sources. Nice try troll. Patents are not copyrights. Troll harder broseph. this is just like the time apple got samsung devices ''banned'' in the netherlands and apple fans were happy when all that happened was samsung changed a few codes about and NEVER got banned....samething going to happen hear,apple fans cry for joy that htc is banned from april but htc changes a few codes and guess what? not single htc device gets stopped from being sold. Best way for HTC owners to get an ICS upgrade, as it appears that ICS does not infringe the one patent that was upheld.... Potentially a happy day for HTC owners and owners-to-be. Man, that was what I was thinking about! With only older versions of android infringing the patent, it would force htc to update every phone's firmware! But then, froyo and earlier versions only. So does that mean gingerbread phones would not be affected? Rejoice ye Apple Dweebs, Lord Jobs has given thee righteous vindication against that which would hail itself supreme. Let not their contacts populate in a manor set forth by our master, All praise the Jobs. I will say this AGAIN, when Motorola is done with APPLE for infringing on real patients, we all will see Apple sheep mope and cry about its not right and not fair. Amen to that brother. I want to see the White Death exterminated!! It is funny that they threw 10 patent at them and only one stick. And if people know anything it is over hyperlink in email and in text message dealing with phone number. This was a patent in 1999. It was for computer but smartphone are mini computer. There are people out there fighting our country, freedom. And this is what Apple wants to fight about? Go to hell Apple... I guess the death of Steve Jobs wasnt enough... too soon? Raise ye Apple dweebs and join our brother gallitoking in a toast. Let us drink the Kool-aid given to us by the Steve. A toast in the words the elder RIM has taught us 'Sue unto others before others can sue unto you'. Let us hold true our beliefs that no one shall bring another platform before the Jobs and that his handset reigns supreme; for memory shall not to be expanded nor batteries replaced and that his proprietary power connection is the only true design. Drink we now together and fandriods cast aside, for we pursue the path of the fallen Palm and the prophet RIM. Let us stand together as we stand in line at the temples of white and march blindly into the sea. who made the first touchscreen phone any way?